McMahon Mennonite Brethren Church in McMahon, Saskatchewan, located 32 km southeast of Swift Current, began services in 1926, and formally organized in 1927 under the initiative of C. C. Penner, with a membership of 18. The meetinghouse was built 20 miles (32 km.) southeast of Swift Current in 1928. The congregation originated through immigration from the Soviet Union. The first leader was Jacob Derksen, succeeded by C. C. Penner and Heinrich F. Klassen; the latter was still serving as leader and pastor in 1957, with a membership of 20. In 1965 there were 27 members. McMahon was known as Reinfeld Mennonite Brethren until 1956. It was part of the Herbert District conference. The congregation dissolved in 1967 and merged with Bridgeway Community Church in Swift Current. Toews, John A. A History of the Mennonite Brethren Church: Pilgrims and Pioneers. Fresno, CA: 1975: 163. Available in full electronic text at: https://archive.org/details/AHistoryOfTheMennoniteBrethrenChurch. Regehr, J. I. and Marlene Epp. 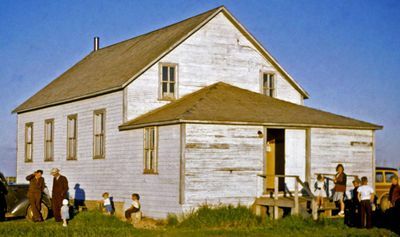 "McMahon Mennonite Brethren Church (McMahon, Saskatchewan, Canada)." Global Anabaptist Mennonite Encyclopedia Online. February 1989. Web. 19 Apr 2019. http://gameo.org/index.php?title=McMahon_Mennonite_Brethren_Church_(McMahon,_Saskatchewan,_Canada)&oldid=163450. Regehr, J. I. and Marlene Epp. (February 1989). McMahon Mennonite Brethren Church (McMahon, Saskatchewan, Canada). Global Anabaptist Mennonite Encyclopedia Online. Retrieved 19 April 2019, from http://gameo.org/index.php?title=McMahon_Mennonite_Brethren_Church_(McMahon,_Saskatchewan,_Canada)&oldid=163450.